Here at HeadRed we first talked about the Google Algorithm update affecting local search; Pigeon, back in July 2014 when it was first rolled out in the US. Fast forward to December 2014 and the Pigeon finally batted it’s wings in our local packs and SERPs (You can see our Birds-Eye view of the update here). So with Google clearly cracking down and looking to optimise local search results based on location, we’ve created this guide to show how you can improve your website’s performance for local rankings. How important is ranking locally? A great way to think about optimising for Local ranking is thinking of it as trying to tell Google a story Start with your name First things first, ensure Google knows your name and can link citations back to your webpage. Citations make up a huge part of the ranking factors for algorithms as it helps establish authority that your business exists in the given locations. Then Tell your Story Create valuable content on-site, this includes getting the correct headers, title tags and having unique, location relevant references/info on-site if you have individual pages, but also including local signals in your blog. Tell them where you’ve been If you have multiple locations it’s important to build up citations, local-specific pages on your site and also a Google+ page if each location has a physical address. Tell them what you’ve done. An easy way to do this is with content, but you can also do this with links. Get in touch and engage with those companies; suppliers, customers etc who you are in contact with offline and think of ways you can gain links off of them in an online setting. Google wants to reward those businesses with an actual local presence/relationship so translating this into something which can be recognised by their algorithm is beneficial. Remember though there’s no one way to optimise your page for guaranteed local SERP results so rather than focus on the latest SEO success fad, instead balance your workload to ensure each method of optimisation is carried out. 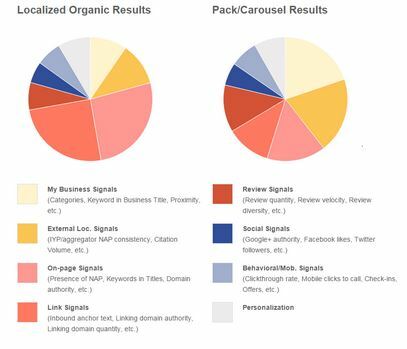 Take a look at the results below from a study conducted by Moz where they asked industry experts which factors they felt most affected local ranking results since the Pigeon Update. Based on these results you can get a rough idea on where people in the SEO industry are looking to focus their attention based on weightings in the rankings. 1. On-site Onsite optimisation consists of ensuring that each of your area’s has a service page on the website, as well as ensuring NAP is matching to that displayed in your citations and Google Places account. 2. Google Local/Places You want to ensure your Google My Business/ Google+ pages are correctly optimised. Click Here to see Google Places Checklist below 3. Social Set up social media profiles including Facebook Twitter and claiming a listing on Foursquare, all of these sites correctly set up to your business help reinforce to Google that you are a legitimate company. 4. Citations Important for Google to establish your online authority, citations involve ensuring you have submitted your business NAP (Name, address and phone number) to local and national directories in line with your websites displayed NAP for Google to the reference back to you. 5. Link Signals/Backlinks When looking to optimise for Pigeon don’t forget there are still Penguins and Panda’s wandering around the websphere so keep an eye on your content (fresh content & no duplications) as well as keeping a good eye on your backlink profile to ensure your are getting quality links and removing any spam. 6. Reviews Used as a signal in local rankings and also displaying prominently as part of schema and Google Places listings, it’s important to try and obtain real reviews on your profile to not only establish yourself as a reputable company in the eyes of potential customers/clients but also for Google to recognise this authority to help strengthen your position in SERPs. A great way to see how much significance reviews have in your industry is to take a look at who is ranking in the local listing map results; do they all have reviews, how many and how recent and use this as a guide to achieving reviews 7. Schema Using schema is a great way to improve the appearance of your site and highlight key things for your business in the SERPs. Correctly employing schema markup to your HTML can help you to highlight customer reviews, publication dates and generally provide more information (rich snippets) about your business that Google may not have naturally presented using your meta description. Create supporting content in the business information area with further reference to keywords & services. Begin establishing NAP profile (Name, address, phone number) across quality web directories. Google is now looking for you to give a lot more to receive more prominence in local results. 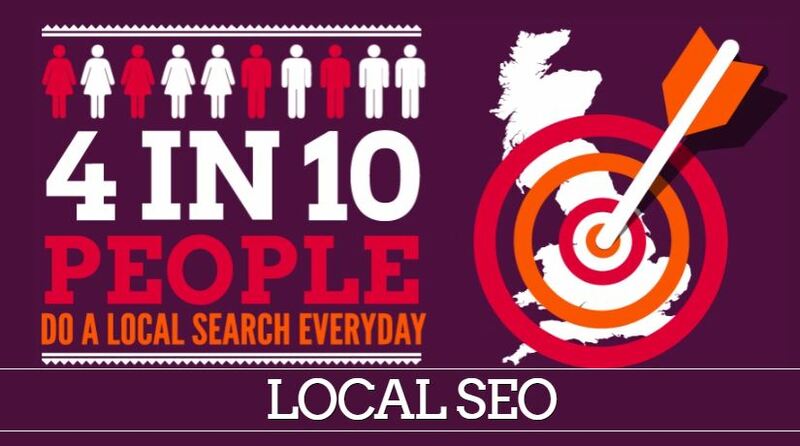 4 in 10 people do a local search everyday so it’s never been more important to get your site optimised in local SERPs. Here at HeadRed we recognise the importance of being known locally which is why we offer tailor-made local SEO strategies including onsite optimisation, local PR and directory optimisation. To find out how we could help you improve your local visibility visit our contact page.